The Southern flying squirrel is commonly found throughout the eastern half of the United States including South Carolina. Being a nocturnal animal, they are rarely seen. This little fella was caught at a bird feeder one night. These pictures were taken in the Summertrees neighborhood of Johns Island showing they are quite common in populated areas. Our observer reports he frequently can sense them swooshing through the yard at night and occasionally sees them but not during the day. 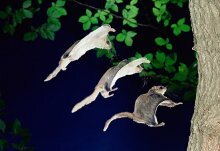 These squirrels don’t actually fly but glide using a flap of skin that stretches between their front and hind legs as a “wing”. The yellow patch on the side of this guy’s belly is his tucked-in “wing”. A professional photographer from the UK got some great strobe stop action shots of one in flight. Go to the Warren Photographic website to see a larger version of their great shot. One of our favorite flying squirrels is the Richmond VA double-A baseball’s mascot. The rally cry for the “Flying Squirrels“, a farm club for the New York Yankess, is “Go Nuts!”. And who can forget the immortal Rocky the Flying Squirrel of Rocky and Bullwinkle fame? For more information about flying squirrels see the post on the SC DNR website.